Our treasure hunts come with a set of ready made puzzles and riddles that create a trail of exciting clues to follow around your home and back yard, the local park etc. All puzzles are original, colorful, entertaining and challenging (we pick puzzles to fit your kids' age). You can also select a theme for the game so this could fit a Birthday party, Easter, A fairy themed slumber party and many other occasions. All this goodness comes with a wizard that helps you create your game in less than 5 minutes. Try it and we promise you won't regret it! 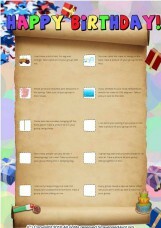 If you are looking for scavenger hunt ideas, this website is the biggest resource of free printable scavenger hunts, with over 15,000 games. 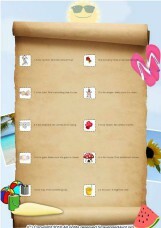 Just find the one that's right for your kids, print and play for free. In this type of game, the kids have to complete 10 missions of either collecting items, performing tasks or taking photos. 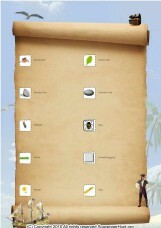 A puzzle treasure hunt can be played with groups of children, each group is made up of 4-5 kids. Each group receives a printed page, containing the first puzzle. When they solve the first puzzle, the hiding location of the next clue is revealed to them, then they run to find the next page. The next page will include a different type of puzzle for which the solution will lead to the hiding location of the 3rd puzzle and so on. When the kids have solved all 6 puzzles they arrive at the hiding location of the treasure. They find the treasure, along with a greeting page congratulating them for finding the treasure. You can entertain up to 20 children by dividing them into groups of 4-5 kids. You than create several games, each with its own hiding locations and puzzles. The basic scavenger hunt is simple and fun. You simply use our wizard to create 10 different missions. Each mission could be either an item to fetch (hence 'scavenger') or a fun mission to perform or a photo to take. It's up to you and you imagination to come up with great missions, but you can use our wizard to get great ideas that other people already thought up. 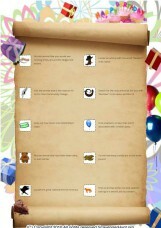 Our wizard also helps you to add fun graphics (clipart) to each mission to make the game colorful.